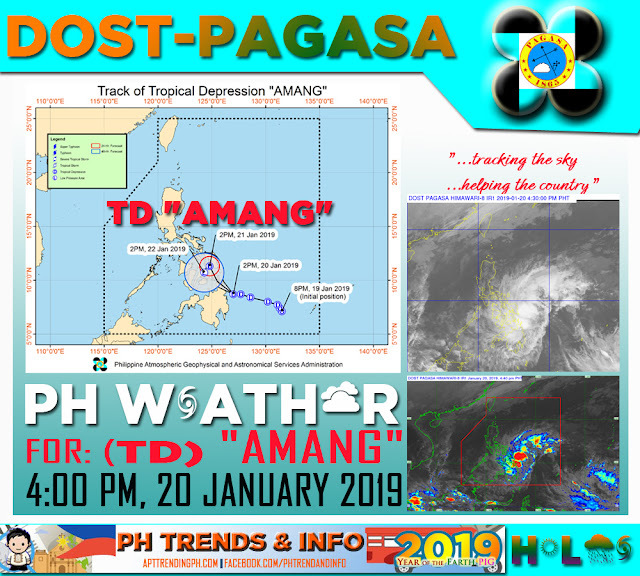 Home PAGASA DOST-PAGASA: Weather Update for Tropical Depression Amang as of 4:00 PM 20 January 2019. DOST-PAGASA: Weather Update for Tropical Depression Amang as of 4:00 PM 20 January 2019. TROPICAL DEPRESSION AMANG CONTINUES TO MOVE CLOSER TOWARDS THE SURIGAO PROVINCES. Today (20 January), moderate to heavy rains will prevail over Caraga, Northern Mindanao, Eastern Visayas, Davao Oriental, Compostela Valley, Catanduanes, Albay, Sorsogon, Masbate, Northern Negros Provinces, Northern Cebu, and Bohol. Meanwhile, tomorrow (21 January), moderate to heavy rains may prevail over Eastern Visayas, Bicol Region and Dinagat Islands. On Tuesday (22 January), moderate to heavy rains may be experienced over Eastern Visayas and Bicol Region. "AMANG" is expected to make landfall over Surigao del Norte mainland or Siargao Islands between this afternoon and evening. Eastern Samar, Samar, Biliran, Leyte, Southern Leyte, Eastern Bohol and Northern Cebu.